The Daily Don is the best of artist Jesse Duquette’s fabulous Instagram gallery of political cartoons relating to the Trump administration. It began in the wake of the first Trump press conference that gave us the weird and unnecessary lie about crowd sizes. Right then, Jesse thought, if this was Day One and the lying was already this casual and obvious, what did this mean for Day 2? or Day 100? He drew his first picture: Sean Spicer delivering his line (“Period.”), added a quote from Orwell’s “1984” that seemed particularly relevant, and posted it to Instagram with the caption that he was going to attempt to document every day of the Administration until the end—a vow that he was maybe 35% serious about. But he has not missed a day and is still going strong. These drawings are the perfect antidote to the cries about “Fake News!” and “Build a Wall!” They help us all stay sane and smile (however nervously) through these strange times. This book pulls together selections from the first nearly-two-years in office—from Muslim bans to Melania jackets and all the beef-tweeting covfefe in between—and acts as a semi-accurate record of what these strangest of strange times were like for those of us who were there and lived to tell the tale. Because what better method to record a cartoon presidency than with colored pencils and markers? 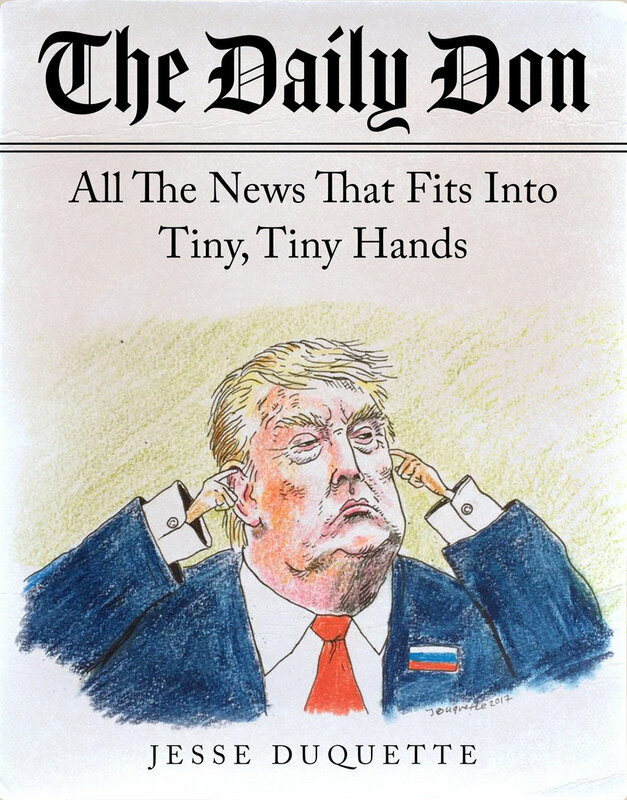 Feel free to post your The Daily Don: All the News That Fits into Tiny, Tiny Hands-P2P torrent, subtitles, samples, free download, quality, NFO, rapidshare, depositfiles, uploaded.net, rapidgator, filefactory, netload, crack, serial, keygen, requirements or whatever-related comments here. Don't be rude (permban), use only English, don't go offtopic and read FAQ before asking a question. Owners of this website aren't responsible for content of comments.